Denis and his wife Karen have lived in Heritage Hills for quite some time. As you may know, in 2011 Denis was diagnosed with a type of severe hypertension and scleroderma, which eventually attacked his lungs. Dependent on oxygen for over two years, his condition worsened to the point where he needed a double lung transplant, which he received in 2013. Since Denis’ transplant, he has been hospitalized many times for rejection; an unfortunate, yet somewhat common result of an organ transplant. Denis continues to remain medically fragile and faces challenges due to his compromised immune system. Due to these challenges, Denis travels many hours each way to the transplant center at Shands every 6 weeks for multiple medical procedures, including x-rays, blood work, bronchoscopy and more. He needs constant monitoring, testing, and costly medications to ensure his new lungs continue to work properly and keep them from failing altogether. 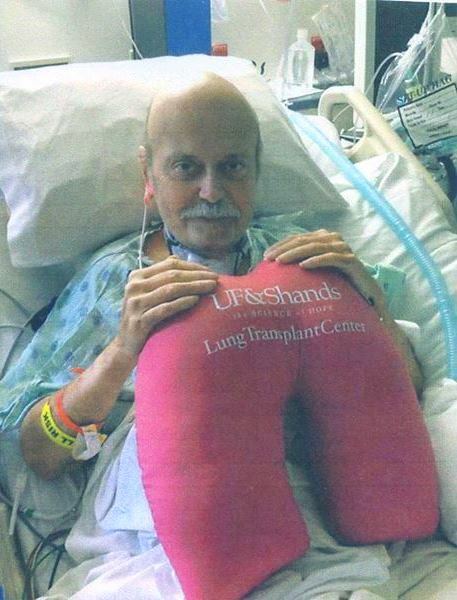 Even with insurance, Denis’ post-transplant medical bills are becoming overwhelming; out-of-pocket expenses include travel back and forth to Shands, co-pays, deductibles, medications, and lengthy hospital stays. Denis is a wonderful person and friend, was a dedicated Boy Scout Leader and someone who enjoyed helping those less fortunate; now, Denis needs your help and support. To help with this financial burden, a fundraising campaign in Denis’ honor has been established with HelpHOPELive, a trusted nonprofit organization that has been providing community-based fundraising guidance to patients and their families for more than 30 years. All donations are tax-deductible, are held by HelpHOPELive in the Southeast Lung Transplant Fund, and are administered by HelpHOPELive for transplant-related expenses only. Please consider making a contribution today by clicking Donate Now. Your support is critical to the overall success of Denis’ struggle. Please know that every contribution counts. On behalf of Denis and his family, we thank you in advance for your kind consideration and generous support. Thank you to every one that has made a contribution Towards my Many Hospital Bills. All Contributions are Tax Deductible. and any Contributions are appriciated No matter how small. 1st of all I want to thank every one who Donated to HelpHope Live. And if any one else wants to make a small Donation it would be appreciated No matter how small every little amount helps. Denis Goes Back To Shands In Gainsville Fla for more Surgery Nov 19th. He has bad acid reflux which is damaging His new lungs. The Doctors will be doing stomach surgery on him.